The first Star Wars movie in 10 years, The Force Awakens goes back to the roots of the franchise with a feel-good rollicking space adventure. The film singularly lacks originality, but features plenty of heart and unflagging amounts of energy. About 30 years after the events of The Return Of The Jedi, Luke Skywalker (Mark Hamill) has gone into hiding. In the absence of the one remaining Jedi, the Republic flounders and comes under threat from a new evil organization called The First Order, with an army of stormtroopers commanded by dark knight Kylo Ren (Adam Driver). On the planet Jakku, the Republic's ace resistance pilot Poe Dameron (Oscar Isaac) obtains a partial map file that may contain clues to Luke's whereabouts, and hides it in a BB-8 droid. 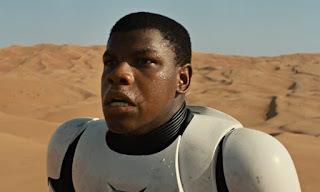 When Poe is captured by Kylo, his escape is enabled by storm trooper Finn (John Boyega), who wants to defect and join the resistance. Meanwhile BB-8 is rescued by Rey (Daisy Ridley), a resourceful scavenger on Jakku who has lost contact with her family. 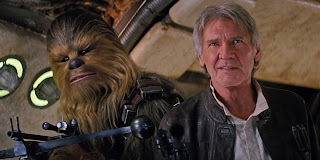 Eventually Finn, Rey and BB-8 team up, steal the ancient but still capable Millennium Falcon and accidentally join forces with Han Solo (Harrison Ford), back to his smuggling ways of old, and still with his loyal friend the Wookie Chewbacca (Peter Mayhew). They try to make their way to the rebel base where General Leia Organa (Carrie Fisher) is trying to organize the Republic's resistance against The First Order. On a side trip to the planet Takodana, Rey meets the wise pirate Maz Kanata (Lupita Nyong'o), and upon finding an ancient lightsaber is exposed to powerful but disturbing visions that awaken her to the strength of the Force. But The First Order has a mammoth new weapon in the shape of the Starkiller Base, and Kylo will not hesitate to unleash death and destruction on a mass scale to locate Luke and crush the resistance. Less an evolution and more of a feel-good reboot, The Force Awakens takes few risks, but does what Star Wars does best. Director J. J. Abrams ditches all of the politics and most of the character conflicts that defined the prequel trilogy, and brings back the fun factor, humour and frequent but short action set-pieces that defined the birth of the franchise in A New Hope. The Force Awakens is fast, entertaining, funny, sharp, and sometimes hokey, and for less demanding fans, probably a perfect definition of what a Star Wars film should be. But it is also exceptionally derivative. Almost every major element of the film is either a strong echo or a simply blatant recreation of an already-seen component from the history of the franchise. The hidden message in a robot, Rey's humble origins on a dusty planet, the familial conflicts and betrayals, the heart-breaking sacrifice, and the endless battles with stormtroopers who crumble like so much cheap tin: it's all been seen, heard and done before. The Force Awakens also hurtles to its biggest disappointment in a muddled climax that throws all sorts of action movie cliches into a hurried, almost childish mix, before settling for a most familiar, and poorly executed, final assault. Also rather unsatisfactory is the rush towards decisive moments. Kylo's lineage is revealed quite early, while his struggles and potential limitations surface before he can properly cast an evil shadow. Meanwhile, Rey's positive abilities with the Force develop remarkably quickly, compared to Luke's much richer journey. The good moments almost exclusively revolve around Rey. 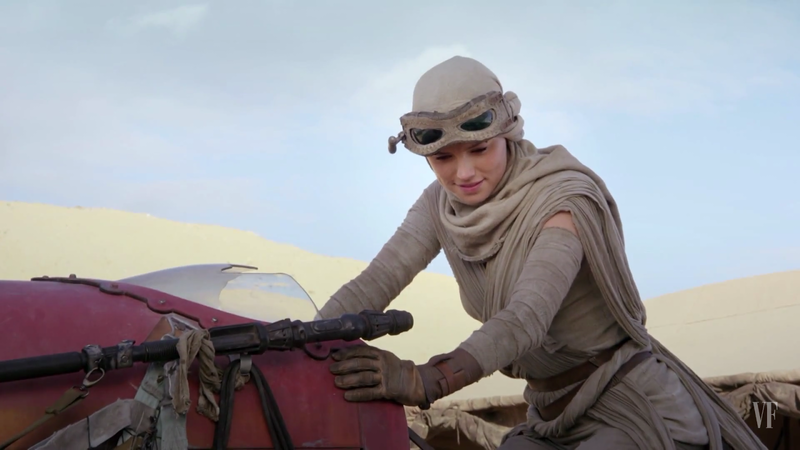 The new central heroine of the series, Daisy Ridley brings to life a bright, adventurous woman, worth investing in as the series progresses. Kylo also carries potential but Adam Driver's performance is only vaguely promising due to uneven character development in the script (co-written by Lawrence Kasdan and Abrams among others). Finn and Poe are less interesting, while BB-8 hits the perfect note as the new robot, rolling into the franchise on just the right side of cute. R2D2 and C3PO are reduced to cameos for this outing. Neither ground-breaking nor an outright disappointment, The Force Awakens is often fun but always familiar.